800 million people live in and of the forest. Many are poor and would get a better life if their commodities and work were valued higher. 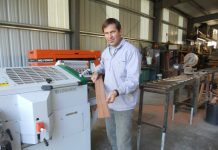 Part of a solution was presented this summer in a one thousand year old church ruin: doubly eco-labelled wooden flooring, produced in southern Chile with equipment from Logosol. It all began in Curacautin, Chile. This village lies in a long valley, which used to be surrounded by large woods. 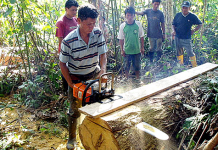 Many years of harvesting trees without replanting has led to the disappearing, more or less, of the woods and of many job opportunities with them. The trees have started to come back, but not to the extent that makes logging of the old times possible or welcome. A couple of years ago, SSC Forestry started a project in the village, with the aim of using commercial forces to create job opportunities, reforest the land and increase the biodiversity. 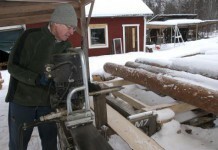 The project is realized with equipment from Logosol, among other things a Logosol Sawmill, a Logosol Låks frame saw, a PH260 four-sided planer/moulder and a specially designed drying plant built from the Sauno wood kiln. The question has been who is going to buy the timber that is produced. The answer is the Swedish flooring manufacturer Kährs, which has activities in 55 countries. “Here we have a fantastic story which adds value to our flooring,” Bruce Uhler, environmental ambassador at Kährs, explains. He stands in a church ruin in Visby, on the Swedish island Gotland in the Baltic Sea. On the ground lies the first flooring like a catwalk. The launching will take place during a mingle party arranged by a trade union, which at the party presents different Fair Trade labelled products. Besides the flooring, workwear made of Fair Trade cotton will be shown. The models are Swedish top politicians, among them the leader of the Green Party, Åsa Romson, who will show a French uniform for conductors. 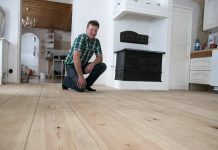 ”This is the world’s first flooring that is approved by both FSC and Fair Trade,” Bruce explains. FSC is the world-leading eco-labelling for sustainable forestry with biodiversity. Fair Trade works to give the people who make the products reasonable working conditions. By the double eco-labelling, Kährs promotes both the environment and the people. This is an important added value, which makes the customers willing to pay more for the products, which in turn generates money to those who work in the forest and to forest regulation. But a heartwarming story is not enough. The flooring is intended for public places and must be of good quality. 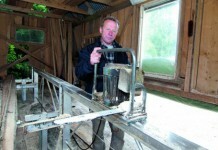 The sort of wood used is a variety of beech, and tests made by Kährs show that it is better than expected. 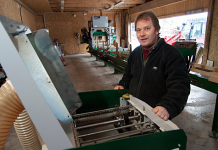 “The wood is more robust than many of the tropical woods we have in our production,” says Bruce. 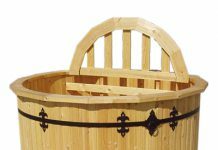 One welcome feature is the possibility to stain the wood with heat treatment and natural oils. The result is everything from traditional blonde beech to flooring with blackness that reminds of ebony. The same sort of wood can replace several others, including tropical woods. The business in Chile is run by SSC Forestry, originally a Swedish company that works with forest certification. Klas Bengtsson is the CEO. ”This is not an aid project, but a commercial venture to create development and biodiversity,” he emphasizes. Due to this, investing millions in building a large-scale sawmill has not been possible. But at the same time the end product has to maintain good quality. 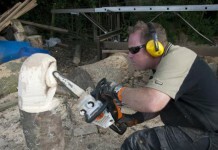 ”If you only try to keep costs down, there’s a considerable risk that you ruin the timber. It’s a matter of finding a balance between low initial investments and high quality, so that the end products can be sold at good prices,” says Klas. 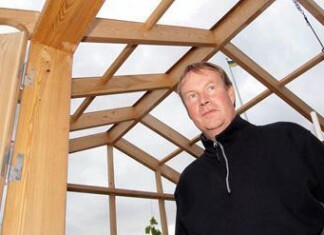 Present at the launching was the Swedish trade union that organizes employees within forestry and the wood industry. The project in Chile has their full support. ”We have nothing against trading, as long as it is fair and people have decent conditions,” says the union chairman Per-Olof Sjöö. 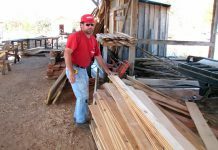 The sawmill in Chile is a pilot project. The idea is that the project will spread over the forested parts of the globe and create better conditions for more people and forests. Technology from Logosol will have an important role in launching businesses and starting delivery.